If you heard a scream on Monday evening at around 10:40 PM, it may have been me. You see, my husband and I were invited to a birthday dinner on Tuesday night, so on Monday I decided that I would bake something for the birthday girl. I’d been dying to make 101 Cookbooks’ Amazing Black Bean Brownie Recipe for a long time, but you know how my husband felt about that idea. Monday night, I hoped, was my chance. I ran to the grocery store after work to get the ingredients, and I finished dinner just in time to start baking during the first new episode of The Bachelor (yes, I watch The Bachelor and I like it!). I also made peanut butter frosting from the Peanut Butter and Chocolate Triple Layer Cake that Edwin and I made in November to frost the brownies. What could go wrong when you have peanut butter and chocolate? Fast forward to over an hour and a half later, and I had a freshly cooked and cooled black bean brownie in my hand. They smelled a little beany, but since I was assured these brownies had no beany taste to them I didn’t worry. I took the first bite and……. BEAN CITY! Wow, I thought, maybe I just have an uncultured palate? I ate another one and it was still a black bean extravaganza; I couldn’t believe it. I slumped on the couch and furiously typed away to Edwin, whining that I didn’t know what could have gone wrong. Then, as my eyes scrolled down the ingredient list, I finally caught the problem… the enormous, outrageous, glaring problem. It is with great embarrassment that I admit to you, DinnerCakes readers, that my tired, pre-occupied-with-The-Bachelor eyes mistook 2 cups of black beans for 2 cans of black beans. Yes, I doubled the amount of black beans. If anyone would like to try some, they are still in my fridge. I can’t bear to throw them out. So at 10:40 PM on Monday night I could go to bed, forget the whole thing and hope that a simple birthday card would suffice, or I could try, try, try again. I decided to press on. 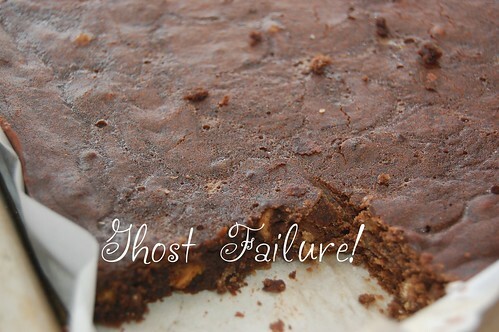 I found a simple brownie recipe, and I made some changes to include the things I’d hoped to accomplish with the black bean brownies (without the black beans this time). I used bittersweet and semi-sweet chocolate only, both granulated and light brown sugar, margarine instead of butter (I know it’s a “no-no,” but at this point I’d run out of unsalted butter), peanut butter chips and Taster’s Choice instant coffee. 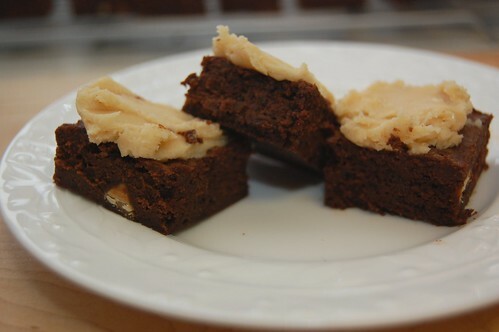 I also added cream cheese to the batter to make the brownies a little more like fudge. I didn’t even try the brownies when I took them out of the oven. I was scared, worn out and very late for bed! But when I finally did frost and try them the next day before the birthday dinner, they were amazing! Hallelujah! Somehow, I’d made it from brownie hell to brownie heaven. 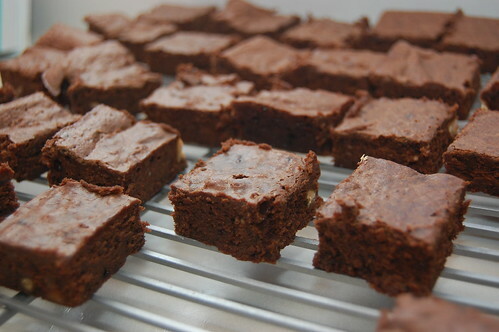 These brownies are excellent. They are dense, rich and fudge-like. The peanut butter frosting and instant coffee are a great combination that give these babies some kick. I may never make brownies without adding some instant coffee again. Say goodbye to dry, “ho-hum” brownies. And please, let’s never talk about black beans. 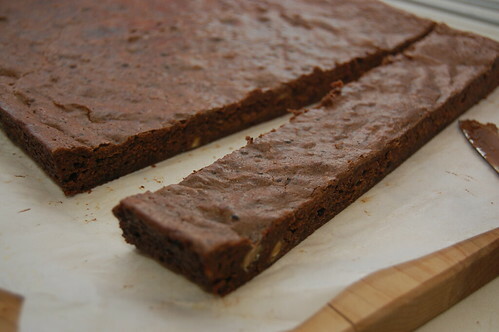 Preheat your oven to 350 F and line a 13×9 inch baking pan with parchment paper (leaving some extra on the sides so that you can carefully lift the brownies out when cooled). 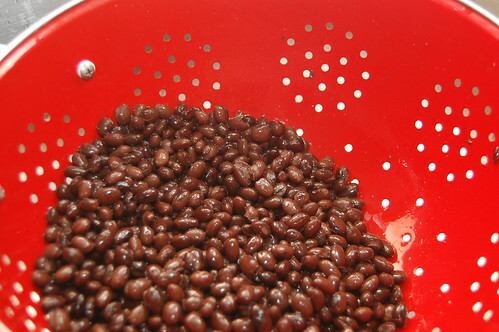 Combine semi-sweet and bittersweet chocolate chips in a microwave safe bowl with the margarine. Microwave on high for 15 seconds at a time, stirring between intervals until melted. 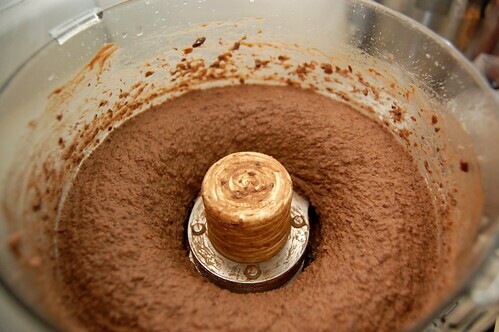 When melted, stir in instant coffee. In a large bowl, combine sugars, eggs, cream cheese and vanilla extract for about 5 minutes. 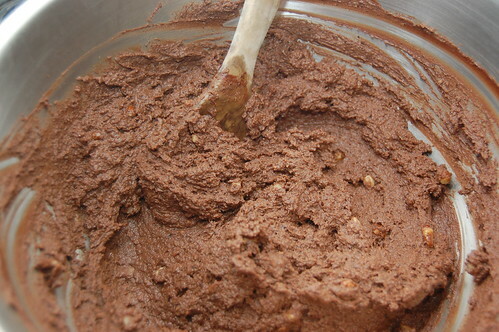 Beat in flour and salt, then add chocolate mixture. Stir in peanut butter chips. Carefully pour into prepared pan. Bake brownies for 30 minutes. Note that a toothpick inserted in the center will not come out totally clean, as these are fudgey. Transfer your pan to a wire rack and cool completely. When cool, remove brownies by lifting parchment paper. Do not cut and frost until your ready to serve, and cut over a cutting board for the cleanest edges. To make the frosting, see the Peanut Butter and Chocolate Triple Layer Cake from November. Remember to halve the recipe; if you make it as shown for the cake you will have quite a bit extra. I made these last night. I put in butter instead of margarine but used lowfat cream cheese (that’s what I had in my fridge). Awesome brownie goodness!!! Haha, we’re glad it worked out. Both Heather and I are big fans of substitutions whenever possible. Shannon – Yay! I’m so glad that you liked them. I was extremely thrilled with the way they turned out; it’s probably a good thing that I made them to give away!